July 7, 2015 (powerhomebiz.net) After two previously successful Kickstarter projects – Dark Sky Tour (2012) and Operation Milky Way (2013) – in which they traveled the Southwest States photographing nighttime landscapes and astrophotography through a telescope, Scott Lange and Nick Foster are back at it again, and this time they’ve launched a project which involves backpacking the famous 211 mile John Muir Trail to capture the nighttime sky along this route through the Sierra Nevada — one of the most majestic mountain ranges on the planet. The trail spans 3 national parks (Yosemite, Kings Canyon, & Sequoia), and the Ansel Adams and John Muir Wilderness Areas. The Sierra Nevada was nicknamed “The Range of Light” by John Muir himself for its brilliant alpenglow and vast varieties of lighting amongst the peaks and meadows throughout the day. 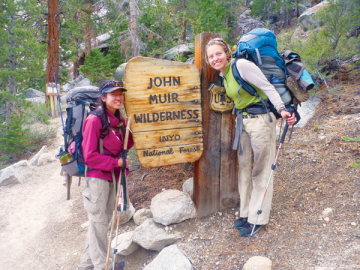 Lange and Foster have had experience backpacking in various sections of the trail before, and now they’ll conquer the entire 211 mile trek to capture The Range of Light in every aspect — night, day, and everything in between, and they’re compiling it all into a hard covered coffee table book to share the experience. With astrophotography and nighttime landscapes being the their forte, they plan to comprise the majority of the book of nighttime shots. This will make the feat that much more challenging as the average day on the trail will consist of hiking 8-14 miles followed by staying up late into the night – and sometimes all night long – to get the shots they want. Combine that with the added weight from the camera gear they’ll have to carry along the way, and this project promises to have a truly rewarding result. Dark Sky Photography – aka Scott Lange & Nick Foster – have been doing astrophotography and nighttime landscape photography for over 6 years. It all started when they met in a physics class at City College of San Francisco. Lange went on to a degree in astrophysics from the University of California at Santa Cruz, while Foster obtained a mechanical engineering degree from San Francisco State University. The two regularly camp or backpack to capture the nighttime sky.